WOW! WHAT A BEAUTY! The cover shows Julian with a sword that could be Emma’s Cortana. We also see the London skyline and the famous Tower Bridge. The cover is a throwback to the Lady Midnight cover, which showed Emma floating in water. Zoom in to see lots of interesting details! 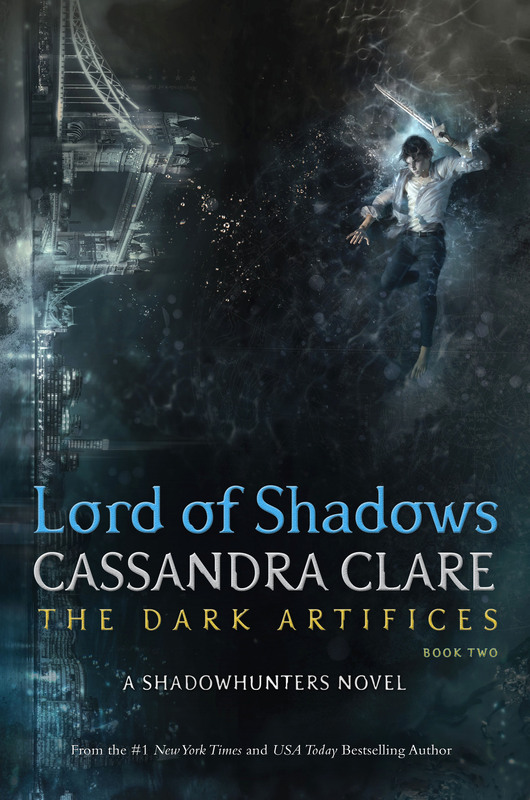 Like every single Cassandra Clare book, the cover for Lord of Shadows was designed by Cliff Nielsen. Lord of Shadows will be published on May 23, 2017 – that’s in 185 days! You can catch up with all the snippets that Cassie has shared so far here. Leave a comment or tweet us your thoughts (@TMI_Source) about the cover! That cover warms my heart. Absolutely love the sideways view of the city which I’m assuming is LA. It’s the Tower Bridge in London. The image of Julian should be bigger. In comparation wuth Emma’s cover he seems very small. I’m a bit dissapointed. The characters travel to the London Institute. The sword is not Cortana as it doesn’t look like it. There are very faint astrology symbols, the center of which is near Julian. Julian looks like he’s fighting free from water. And if you zone it a lot, Julian either have unnaturally long toes or alarmingly veiny feet.